Give your child an early educational advantage that will start to prepare them for the exciting transition from preschool to kindergarten, along with learning another language. Our FasTrack® Beginners program is designed for children 2-3 years old to learn age-appropriate content and English as a Foreign Language during the year prior to them enrolling into kindergarten. This provides children with a strong literacy and cognitive foundation for success while having fun. During our multi-day class schedule, FasTrack Beginners students will be exposed to English while increasing their native language vocabulary in an engaging, collaborative environment. The FasTrack Beginners classroom is child-entered and focused on the learning outcomes of each student. Teachers fluent in both their native language and English will provide students the tools to learn the English language through music, stories and creative activities. 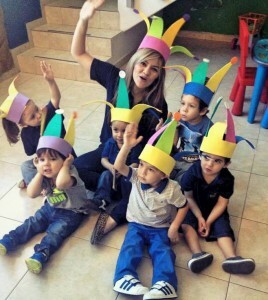 Enroll your child today to begin learning the language of fun!